It has been nearly three months now since my last update on my Mesh Avatar, so where are we? Well first of all i explored having a more stylised avatar that was more characteristic of Pixar or Disney. This started off with some very cool results in blender and creating blend shapes for facial expressions was great fun. But SL can not transfer blend shapes to mesh avatars so i had to decide which fixed expression to use. I tried smiling, toothy grins, determined eyebrows but in the end settled on a sort of vacant whimsical faint smile. Recently though i read that Linden Lab are actually looking into ways to allow creators to upload expressions with mesh avatars. Wether this will be for SL1 or ‘The New Thing’ only time will tell. Another thing that took a while to get right was eye size and chin shape. It does not really matter how the model looks, but when you stand with a group of friends in their old default avatars there is a sense of being an alien and i felt ugly. in the end i had reduced the eyes to what i believed to be an acceptable size that did not freak people out. First experiments with creating a pixar/disney style head had rather large eyes but showed the sort of expressions possible perhaps with HyFy. Even without expressions the bigger eyes sometimes do a great job of conveying emotion. I now really like this anime style avatar as I think it has real fun character and looks pretty dam kool. Im tempted to wear it as my full-time avatar, but I’m too loyal to the old face of Loki 🙂 For High Fidelity though i’m definitely going to be using the Anime model along with the blend shapes to see if i can create a fun expressionate avatar. He’ll be like a dark haired HyFy mirrorverse Loki with black hair and toothy grin. Letting others join the fun. With the Full anime avatar finished it’s now time to move onto making it possible for others to use these avatars. It’s not a simple task of just giving people the avatar though, as others will want options to make their avatar unique and i need to supply them with those options as easy as possible. Some ideas i had back when i first set out to make a mesh avatar have changed, either because they are too hard for me to do, or too complex to expect others to do. I’ve also tried to think of different ways to make things possible. In the end i settled on a system i call the ‘SKNpod’. On release all my mesh avatars will be completely free for everyone to pick up and use. 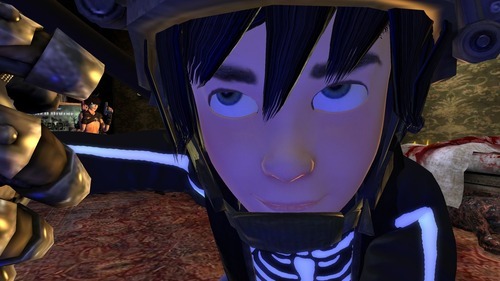 There will be four Mesh Avatars in total; Teenboy, Teengirl, Kid and Anime. 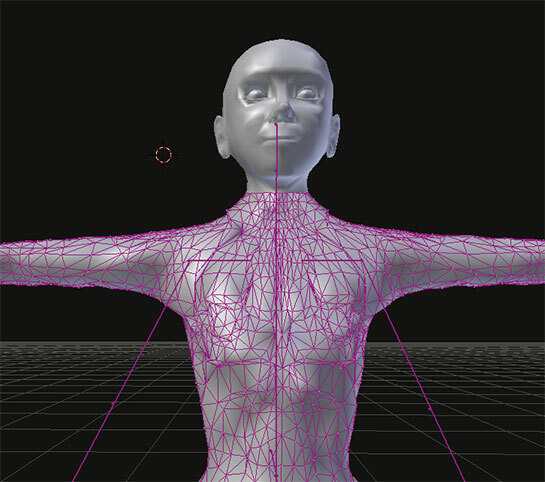 There will be a free mannequin blender file from which creators can make their own clothes for the mesh avatars. Each avatar has a built in menu accessible from the ankle. This will bring up options to change the visibility of your avatar under clothes you wear. You can also choose to have hands gripped or relaxed. You also have advanced options to reset your avatar or SYNC it with the SKNpod. The Avatars skin appears wet automatically if you go under water and slowly dries out in the sun. You can also overide and reset the wet feature for swimming pools. When you stand on the SKNpod, the camera pans round and the front flips down with a colour palette, simply select the colour then click the coloured square to transfer to your avatar. HULK SMASH! PUNY GOD! You will be able to collect SKNpaks for different occasions. 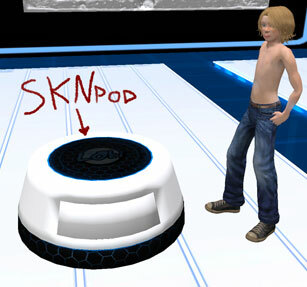 All you do is place the SKNpak on the flip down table while you are stood on the SKNpod then click the SKNpak to transfer the new Skin to be worn. Clicking a secret point on your avatars ankle will bring up a menu of options to better fine tune your avatars look. Seeing as this is a totally rebuilt from the ground up avatar it unfortunately will not be compatible with clothes created for the old SL default avatar. The Joint Rigs of the armature is different meaning you will have to settle for what i and others make for this avatar shape. Sometimes you might find trousers and shorts that work, but its rare. You can’t simply wear the meshy kid avatar with your default avatars kid sized shape. You will find it shrinks below what you currently are. You will need to record your avatars facial settings by number and create a new avatar shape from scratch to use with the mesh. There is a viewer bug. When you take off or swap the joint rigged mesh avatar, it will bork your avatar and the only way to fix it is to relog. This is a problem that effects all joint rigged avatars apparently, so Linden Lab are working on a fix. They almost did fix it too in the latest maintenance viewer, so hopefully it won’t be long before this is no longer an issue. But i can tell you its added 10 times more work for me since overtime i upload the mesh avatar i have to then relog. Creating for the old school crowd. Now that I’ve been using this mesh avatar for the past three months i can’t take it off. If i do take it off i see my horrible old blobby wrists, block feet, sloped shoulders, chunky arms. 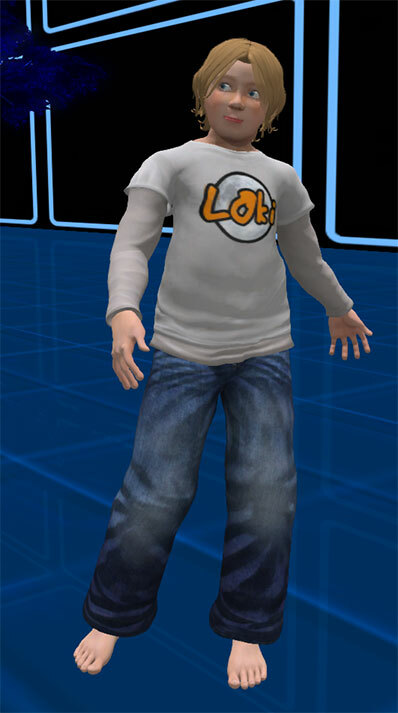 The Default avatar simply was not designed to be shrunk into kid size. But now i’ve created a way to work around it. Creating clothes for this new mesh avatar is a breeze since i don’t have to shrink and smooth out the bumps, and the results are always better than anything I’ve done before. 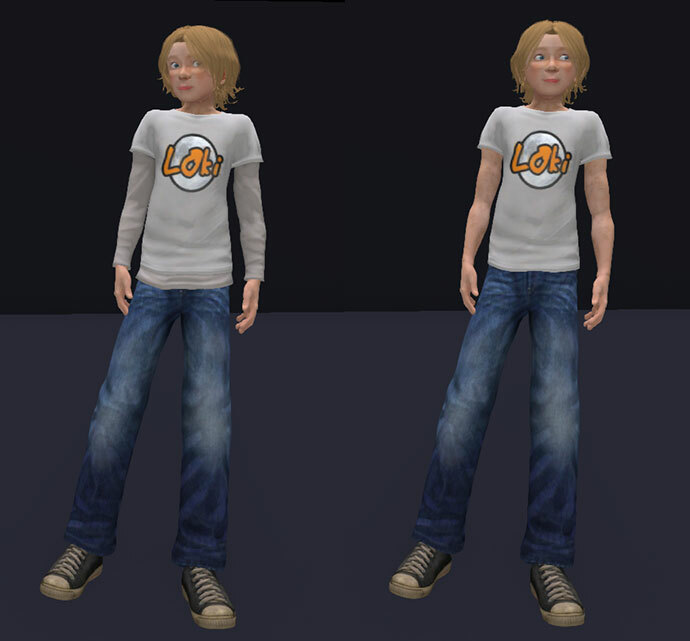 Plus armed with a better understanding of LSL scripting i’m able to add fun features to clothes. Clicking the V4 T-shirt’s back will allow you the option to have with or without Longsleeve shirt under short sleeve shirt. But i still have to think about my friends who don’t feel right in a mesh avatar after all i’m first to admit that my Mesh Avatar shapes will not suit everyone. So i have to continue offering my clothes designs for the old default avatars alongside the new mesh avatars and thats the next part of the project. I’m in the process of figuring out the easiest ways to create a piece of clothing for my mesh avatar which is already super easy, and making the same piece of clothing for old lumpy default avatars which in comparison is very very hard. Being an oldschool kid in SL can get seriously Meshy. Originally this last part of the process was just an afterthought, but after a few unsuccessful tests I’ve now decided i really need to sit down and think it through. I have a few ideas. It just seems ironic that after setting out to replace the old avatar with a new better one, I’m back where i started in a way. I am curious to see how this will work out. The biggest problem for teen girl is in my eyes the offer of make-up. Also it will be intersting to see how transformable the mesh avatar is. For my personal taste it is wayyyy too skinny (and i am not talking about the cartoonish one). So will “putting on some more meat” be possible and what would that mean for the clothing line? Would it still fit?